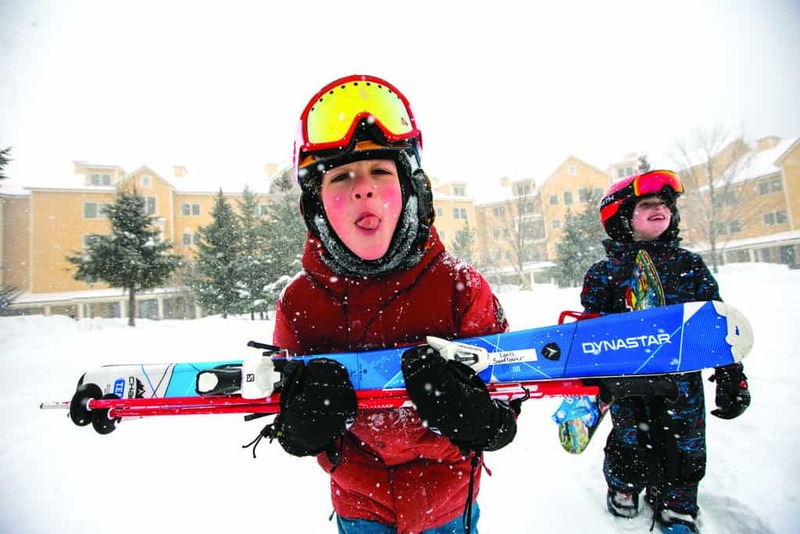 Kids carry skis to the lift at Okemo’s Jackson Gore while catching snowflakes on their tongues. After a week of public outcry and scrutiny, Vail Resorts has reinstated discounted prices for low-income school children participating in snow sports programs at Okemo Mountain Resort. Vail Resorts told snow sports coordinators at public schools in the Ludlow area that the mountain would charge all children a standardized price of $35 for the pass, and $65 for equipment rentals for a total of $100 for the eight-week program. But on Thursday, Dec. 20, after week of online fundraising and public outcry, Vail reversed its decision. Students who qualify for the federal free and reduced lunch program will receive $15 off the passes and $25 off equipment rentals – reducing the price from $100 to $60. Last year, low-income students paid from $38 to the low $50s for the same package. “Now in our third month with the resort, we are enjoying getting to know Okemo and its great programs, like the Okemo Mountain Community Snowsports Program,” the statement said. In Vermont and New Hampshire, Vail Resorts owns Stowe Mountain Resort, Okemo Mountain Resort and Mount Sunapee Resort. Since Tim Mueller, who owned and ran Okemo with his wife Diane since 1982, sold Okemo Mountain Resort to Vail Resorts last summer, the ski resort giant went about standardizing the Ludlow ski mountain with its other ski areas. One of these changes included discontinuing reduced prices for passes and rentals for schoolchildren in the free and reduced lunch program. The increase, officials said, would have forced a significant price tag for families with children that qualify for the free and reduced lunch program. Families with children enrolled in the free and reduced lunch program who attend one of the six schools in the district – which includes Cavendish, Ludlow, Chester and Mount Holly – would have potentially seen the amount they would pay for the snow sports program more than double from last year. Snow sports program coordinators said they had heard rumblings that prices changes would be coming to the mountain, but found out definitively from Okemo early last week. Harrison said she was disappointed to hear of the rate increase and that she was concerned it would mean the death of the ski program at Black River. Harrison said that at Black River, more than 50 percent of the 140 students in the school are in the free and reduced lunch program, and if the reduced rates were taken away, these students would not be able to participate. In the week and a half between Vail’s announcement that the reduced rate would not available and its reversal, schools began trying to fundraise the money needed to ensure funding for the program. Harper, who runs the program at the Cavendish elementary school, said he got the news from Vail last Tuesday and decided to set up a GoFundMe to raise $3,000. In three days, Harper had reached his goal. Harper said he was not surprised that Vail raised prices after buying Okemo, and that change was to be expected. This is why, he said, he decided to set up a GoFundMe page as soon as he had the news from Vail. “It’s a bummer, no doubt about it, but things change. I know parents have counted on the snow sports program because it’s an expensive sport,” Harper said before Vail reversed its decision. Other schools in the district saw the success Harper was having online, and Chester-Andover Elementary School put its own page online. At the time of publication, the school had raised more than half of its $3,000 goal. Becky Tobey, who is the program coordinator at Mount Holly elementary school, said the parent teacher association has been able to fund a large portion of the price increase that comes when a large organization buys a family-run mountain.